Spread the word! For the second year in a row, the NMSU Parking Dept. has a deal that you can really sink your teeth into. 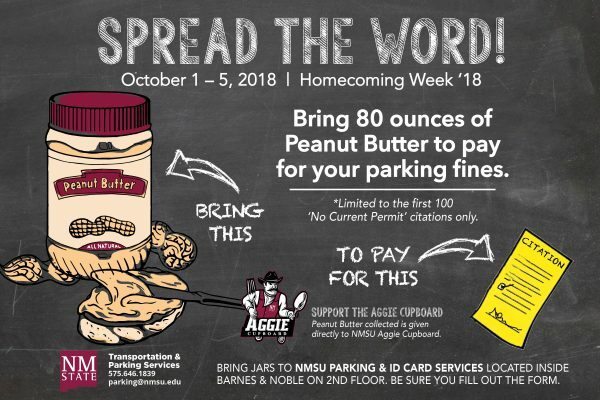 Save money and support the Aggie Cupboard by paying off your “No Current Permit” parking citation in peanut butter. Bring 80 ounces of unopened peanut butter to the new Parking & ID Card Services Office on the 2nd floor inside Barnes & Noble at NMSU, and your citation will be reduced to a warning. This offer is only valid for the first 100 people during Homecoming Week, Oct. 1-5, 2018, and only for “No Current Permit” citations. You must complete and submit a numbered form at the Parking & ID Card Services Office in order to reduce your citation. Select “going” or “interested” on the Facebook event page to receive a reminder. Please contact 575-646-1839 or parking@nmsu.edu for more information.